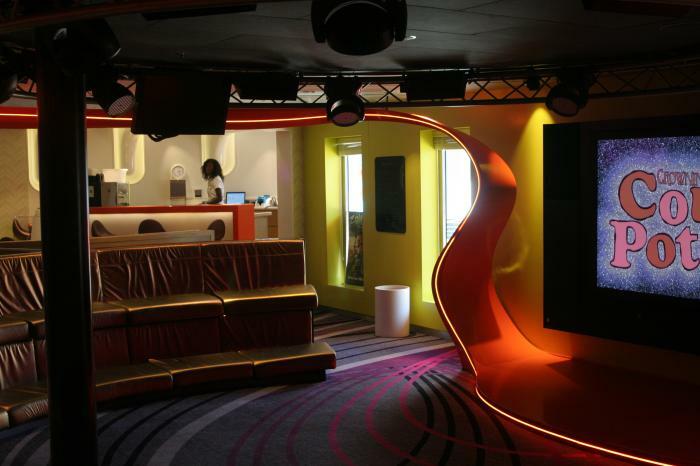 Vibe; The New DCL Teen Hot Spot: New to the Disney Cruise Line is the expanded indoor/outdoor teens-only lounge on the Disney Dream Tigger Travels - Family Adventure Journal Photos From Tigger`s Travels and MORE! Traditionally, when one thinks of a cruise, images of the QE2 come to mind. A place where children of any age are discouraged. Then when the name Disney is added to the mix, images of young children frolicking with cartoon characters. 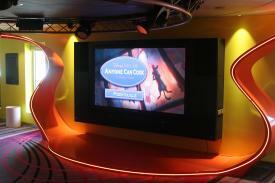 Many cruise lines have added what they call 'teen lounges' but are nothing short of a dismal attempt at best. to private gaming and viewing areas. In the deepest reaches of the lounge, there is a separate theater but to get there you must pass through the DJ and dance area where aspiring DJs can spin and mix their own tracks. Near the entrance of the lounge is the urban coffee bar and throughout the whole indoor space are numerous nooks and coves for video games, music, movies or just kick back and relax with friends. or lounge in the shade, sit in the hot tub or play foosball, ping pong or old school board games set on a giant checkerboard that is designed right into the floor pattern. are not limited to Vibe. 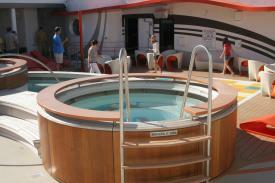 There is also exclusive teen time scheduled for the Sports deck on deck 12 and the Aqua Duck, the first water coaster at sea. 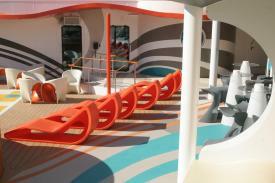 At these times, all other passengers are not allowed so that the teen cruisers can have sole access to these features. As with all Disney clubs and lounges for under-aged travelers, there are counselors that provide structure and chaperone every event. These cast members are people specially selected for this type of environment and know how to enhance the experience for everyone.